The station has undergone a top-to-bottom restoration, from a new roof down to a stronger floor to support the company’s massive apparatus. Along with the new floor, the original scope of work included adding a women’s bathroom and locker room, and upgrades to the mechanical, plumbing and electrical systems. 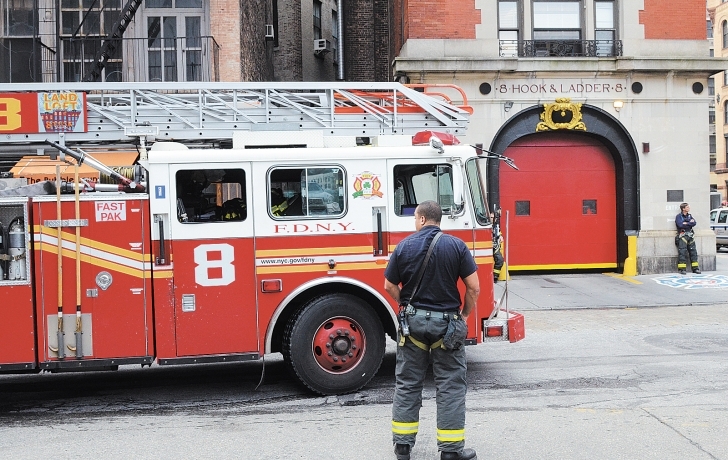 But additional requests by the FDNY added months to the completion time and $3 million to the original $6 million cost of the project, according to Ian Michaels, spokesman for the city’s Department of Design and Construction, which is in charge of the project. Those improvements, Michaels said in an email, included a new boiler, windows, roof, air conditioning on the second floor, and staircase and masonry repairs. Hook & Ladder 8 at its current site goes back to 1866, where a school once stood. Its current building, constructed in 1903, was originally twice as wide, with two vehicle bays rather than one. With the widening of Varick Street in 1913, the house was sliced in half. Even as the building stood obscured by construction netting during much of the restoration, it remained a magnet for fans of the 1984 movie classic. (The house returned to the screen in 2016 with the “Ghostbusters” remake.) Along with its cinematic spook fighting connection, the firehouse also had roles in the 2004 film “Hitch” and a “Seinfeld” episode. Lego reproduced the building in a 4,634-piece “Ghostbusters Firehouse Headquarters” set. In 2011, the beloved structure as a firehouse came under threat. The Bloomberg administration put it on the chopping block, one of 20 fire station sales proposed to raise revenue for the city. In June of that year, more than 100 residents, community leaders and local officials as well as firefighters protested at the firehouse to oppose the sale. A revised city budget eventually allowed all the houses to stay open. In a couple of weeks, the Ladder 8 company will be part of the community once again.